"I feared I was going to hyperventilate"
"an enduring cult hit in the making"
The Cornley Polytechnic Drama Society is in luck! After receiving a substantial donation, they are putting on a production of 1920’s whodunit ‘The Murder at Haversham Manor’. It’s the perfect size for their company and has a thrilling, Agatha Christie-inspired story. Audiences will love it! What could go wrong? As it turns out, everything. Instead of solving the mystery of who killed Charles Haversham at his own engagement party, the actors are left waging a war against the set, costumes and each other as they race towards the curtain call. Will they survive in one piece, or will the entire theatre come down around them? Find out in Mischief Theatre Company’s international smash hit that started at Edinburgh Fringe. Expect split sides, aching stomachs and tears of laughter at this Olivier and Tony Award-winning production. Critics and celebrities around the world love the show and promise that you will, too! 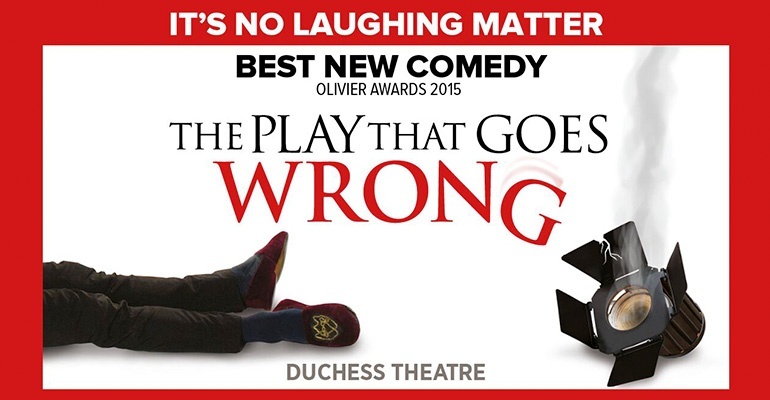 The Play That Goes Wrong is recommended for ages 8 and up. Under 5's will not be admitted. We take your privacy seriously and will never share your contact details. There are no reviews to display. Why not add your own review?